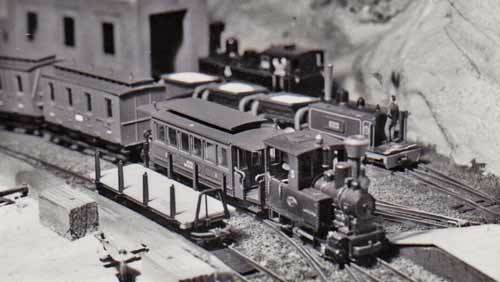 My first model railway, in common with many kids born in the mid-1940s, was an O gauge tinplate clockwork Hornby. No doubt I had lots of fun with it but what I really wanted was an electric train set. So one Christmas in the 1950s it was a real treat to unwrap a wonderful blue box containing a Hornby Dublo 'Duchess of Montrose', a couple of crimson and cream coaches and an oval of track. Another parcel contained the controller so the Duchess was soon running round and round and round... Subsequent Christmasses and birthdays brought extra track and rolling stock. A Castle class and a couple of tanks provided more motive power and for a while the layout lived on a sheet of chipboard perched on a table in a corner of my bedroom. Increasing pressure on space eventually forced a parting of the ways but the mid-60s saw a second layout. This one was small, no more than about five feet long and eighteen inches or so wide. It was narrow gauge - OO9 - so it was a first meeting with 9mm gauge track. Crude scenery was made with plaster-bandage which was painted green. Scenic materials left a lot to be desired in those days! The layout was abandoned after a year or two. There followed a long period without any further attempt at building a railway. I continued to buy some magazines and thus became a member of the 'armchair modeller' brigade, hoping that a layout would become possible - one day. Slowly, even the dreaming stopped and no more magazines were bought. Click here for the YouTube video of John Birkett-Smith's N gauge Ashburton layout. video I found showed Ashburton modelled in N gauge by John Birkett-Smith. It represents the branch line terminus of the line from Totnes as it was in Great Western Railway days. I began to wonder if I could model in this small scale, the first aim being to make some buildings rather than a complete railway scene. Some up-to-date magazines showed a hobby much transformed and N gauge models of a much higher quality than I remembered. The couplings looked as awful as ever but wheels were a bit less steam-roller sized. And there were new scenic materials, static grass being one, and digital control seemed worth investigating with the possibility of much less wiring. From the start I decided that if I was going to build a railway then Rule Number One would apply - it's my railway and I'll run what I like. I admire people who can make an accurate model of a particular location and run only trains that would have been seen in that area. But that's not for me. In fact I would extend Rule One to apply to all aspects of a layout, mixing elements from various times - steam trains, but buildings as they appear today, for example. I started by making some test pieces. 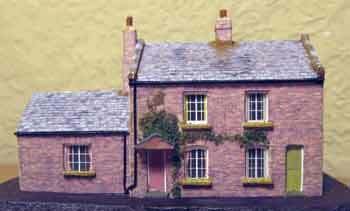 The first one was a brick built shed which would actually be used on the layout a couple of years later. Then came two cottages which haven't been used; one was made with plastikard, the other (see right) with card and paper. I found the plastikard to be the easier medium to work with. I also learnt some tricks to use. In this small scale some of the techniques which are common in 4mm scale seemed inappropriate. For example attempting to layer separate rows of tiles or slates on the roof was very fiddly and resulted in a less than convincing result so I've stuck to using printed roofs, if possible derived from photos of buildings in the area being modelled. Printed brick paper (also based on local buildings when possible) seemed to me to produce more convincing results than embossed plastikard. Painting the latter to produce a convincing wall is a skill which I don't possess. Achieving total realism seems to be pretty much impossible in N gauge. Although I've seen lots of photos of O gauge models which could almost pass as the real thing, and even a few OO ones too, made by real masters of the craft, I've yet to see any N gauge models which could be 12" to the foot scale. The advantage of N is that a broad sweep of landscape (or villagescape in my case) can be modelled in a fairly small space, albeit in a more impressionistic manner. Modellers may use a collection of bits of wood, metal, plastic, plaster and whatever else takes our fancy but hopefully we create a little world of our own which may or may not have any similarity to the real world but gives us pleasure nonetheless. Having decided that I could, indeed, make reasonably satisfying models the next problem was what to choose as prototypes. I've always felt a connection with Finchingfield in Essex - one of my grandfathers was born there. The village has plenty of attractive buildings for inspiration. My own photographs and images from Google Street View would provide information about the fronts of the buildings; the backs and the gardens behind could be invented. Trains never reached the village but there were some stations not far away which could provide some ideas for appropriate railway structures. My idea was that I could either make each building stand alone on its own base or make a diorama keeping at least some of the buildings in the same groupings as they are in the real village. Or perhaps, after making a few buildings I could decide to build a model railway. But the layout of Finchingfield - central pond and greens with the roads and buildings around them - would require a large baseboard even without the trains. If I wanted the option of using the buildings as part of a railway layout it would have to be changed to a more linear scheme running along behind the tracks. The most photographed section of the village is the Causeway leading to Church Hill with the church in the background. 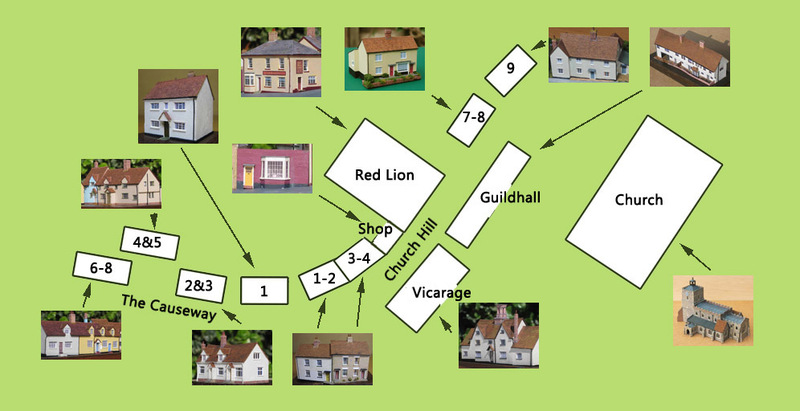 The plan I worked out allowed me to keep much of this arrangement, but on the right side of the road I eliminated three buildings moving the old workhouse (which I'm calling the Vicarage) up the road to be next to the Guildhall. I now had plenty of attractive buildings to model so it was out with the Plastikard and scalpel.